Posted on March 28, 2013 by Dayna B.
Ok, normally trying out a new restaurant wouldn’t technically fit into the “new experience” category I was going for in my list of goals for 2013. 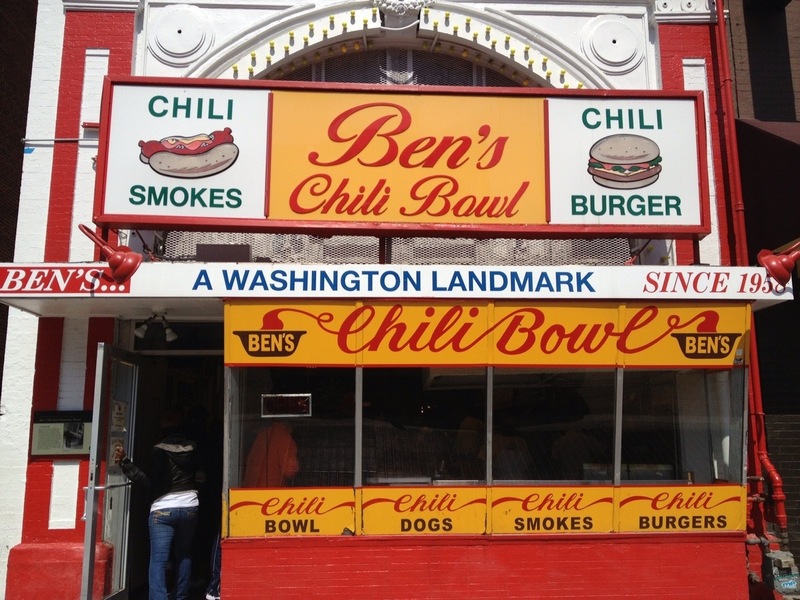 But, Ben’s Chili Bowl is literally considered a Washington, DC landmark. Therefore, I felt the exception could easily be made. 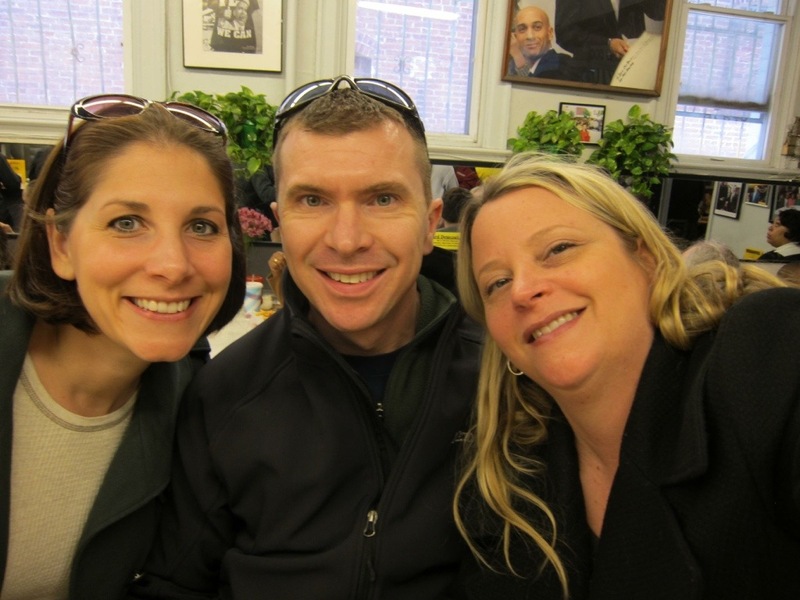 So last weekend my dear friend Renee was visiting and we worked up our appetites while doing some sightseeing in DC. After getting our fill of the DC monuments, it was time to fill our gullets. Ben’s signature dish is the “Original Chili Half-Smoke,” which is a ¼ pound half-pork/half-beef sausage, topped with mustard, onions and spicy homemade chili. I normally do not eat meat unless I know it was humanely raised on a responsible free roaming farm (what I refer to as happy meat), but I made an exception to my rule in order to try one of DC’s most famous dishes. Pictured below is the Chili Half-Smoke, but I topped mine with their veggie chili, rather than their original chili, because it is less spicy (and I am an extreme sissy when it comes to spicy food!). One of Ben’s most famous customers is Bill Cosby and the Half-Smoke is his favorite dish. So much so that he is known to eat up to six of them at one time! 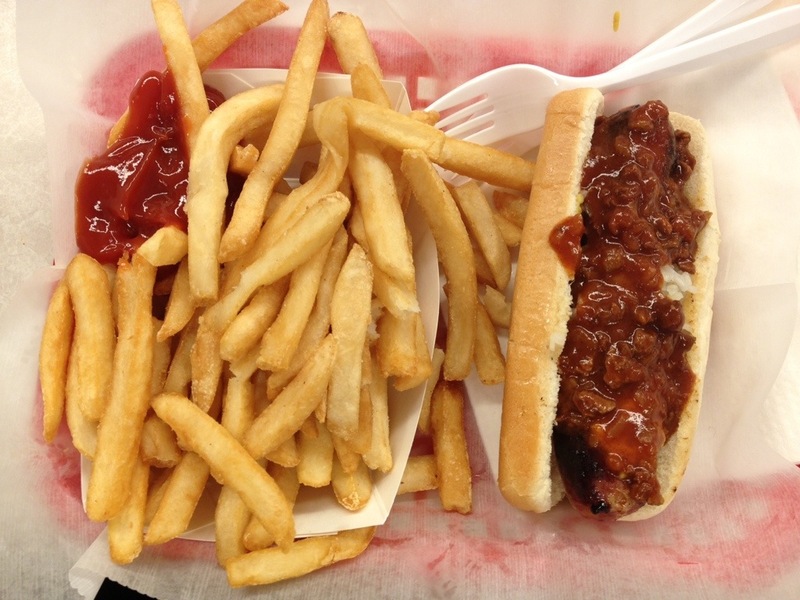 Ben’s Chili Bowl was founded in 1958 by Ben Ali in the District’s U Street corridor. At that time, Washington, DC was officially segregated and U Street was known as “Black Broadway.” Famous jazz greats, such as Miles Davis and Nat King Cole, used to eat at Ben’s after they performed at U Street clubs. During the riots of 1968 after the assassination of MLK, Jr., Ben obtained permission to keep his restaurant open past curfew so he could feed both the police and firefighters working the riots, as well as the activists. Decades later, the construction of the U Street Metro Station forced many businesses to close, but Ben was determined to stay open and he fed the construction workers working on the Metro project. According to the Washington Post, Ben’s “is probably the only business on this strip that survived both the 1968 riots and the construction phase of the Metro Green Line.” Ben and Virginia Ali were later inducted into the DC Hall of Fame. Ben’s Chili Bowl appears in movies, such as The Pelican Brief and State of Play, as well as dozens of TV shows. It was also featured on the Travel Channel’s Man v. Food. Ben’s Chili Bowl has also found a home in many novels, setting the stage as a meeting location for fictional characters. In addition to Bill Cosby and the jazz legends mentioned earlier, many other celebrities have also been to Ben’s Chili Bowl. Chris Tucker, Bono, and President Obama, just to name a few. 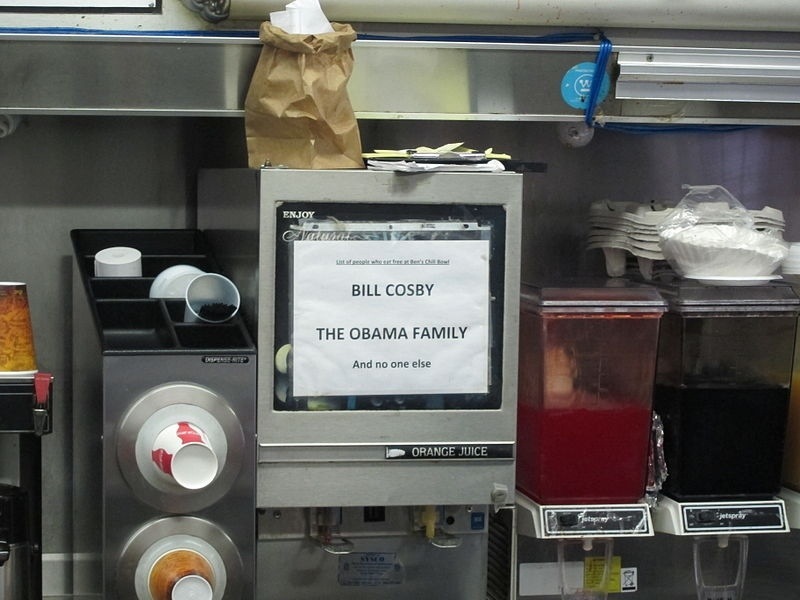 Many celebrities may have expected the royal treatment at Ben’s, but there was always a sign on display that said, “List of who eats free at Ben’s: Bill Cosby, NO ONE ELSE.” The sign was later updated in 2008 to include the Obama family. Posted on March 19, 2013 by Dayna B.
Item# 2 has officially been struck from my list of goals for 2013! 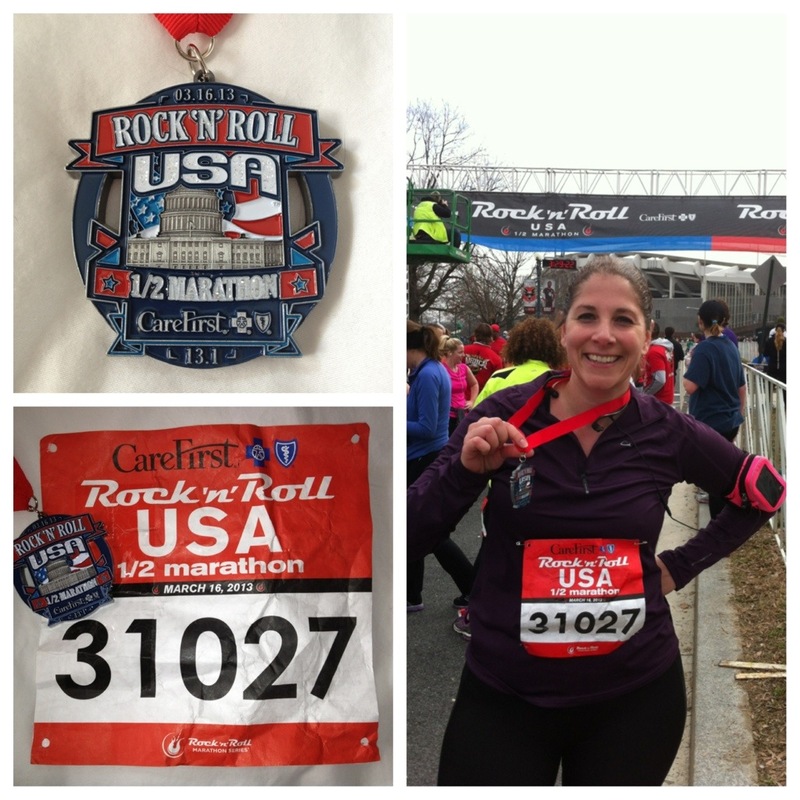 I completed the Rock ‘N’ Roll Half Marathon this past Saturday in Washington, DC. 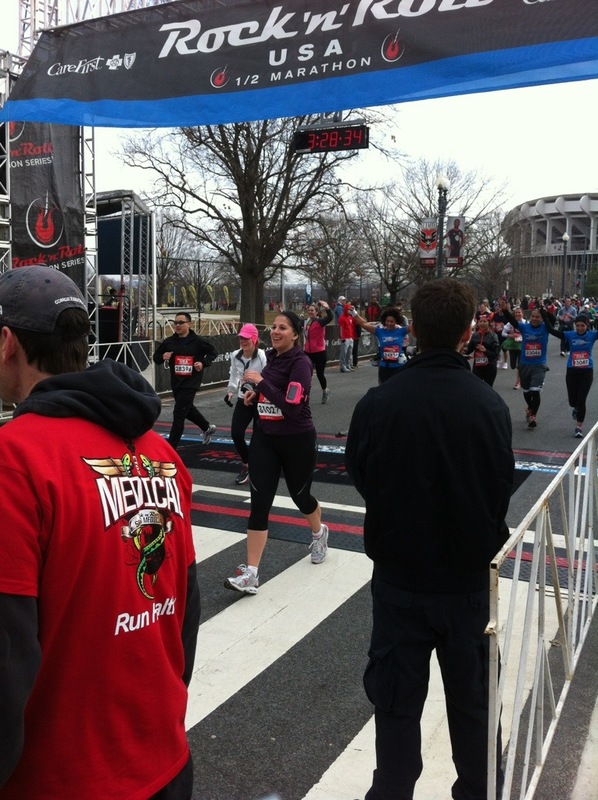 The race began in downtown DC and ended at RFK Stadium. The picture below shows the course as it was recorded by my RunKeeper app. You will notice that according to the app, I ran 13.45 miles. It’s amazing that weaving in and out around people while racing (a.k.a. passing them with my lightning speed!) added an extra .35 miles to my distance. In the future, I think race organizers should shorten race courses to account for such weaving. Please and thank you! I was grateful that it didn’t rain, however, I did not appreciate the hills on the course. I hadn’t done much training running up hills because getting me to run on a flat surface is a feat in and of itself. Throughout the course I ended up climbing over 1,000 miserable feet. Despite these inclines, I was managing to keep my pace at about 11:30 min/mile which was considerably faster than my training runs (about 12 min/mile). At that pace, I thought it might be possible for me to finish in 2 hours 30 minutes when my initial goal was just to a. complete the race, and b. hopefully under 3 hours. Finishing 30 minutes faster than expected would have been quite incredible for my first half marathon. Unfortunately, somewhere around mile 11 I started to have trouble with my left ankle. I tried to “run it off” but the pain kept getting substantially worse until eventually I had to walk. However, I was determined to finish the race running, not walking. I stopped to take a moment to stretch my ankle really well and thankfully that seemed to do the trick. 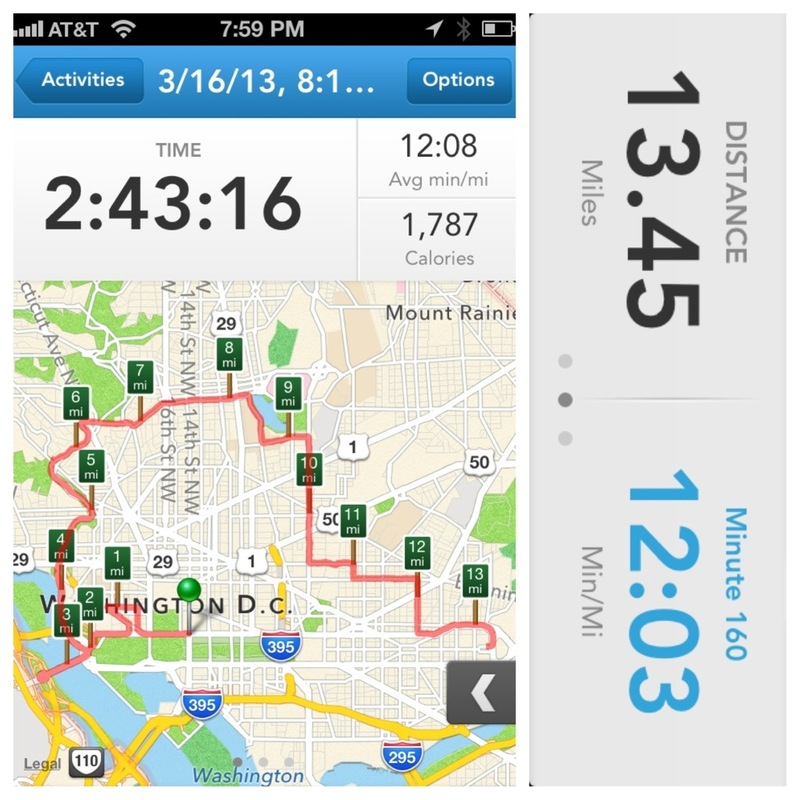 Unfortunately, my ankle incident really slowed me down and my pace dropped back down to my normal 12 min/mile. I still finished in well under 3 hours; 2 hours 42 minutes and 59 seconds to be exact. But let’s just say 2:43 to keep things simple, shall we. I doubt I will lose any sleep over that extra second. If my old Drill Sergeants could see me now! There was nobody in basic training that hated to run as much as I did. If there was a basic training yearbook, I definitely would have locked in the “Least Likely To Run a Half Marathon” slot. Rob met me at the finish line and gave me an insulated plastic liner to keep me warm. Feeling pretty proud of myself, I decided the liner was more like my Superwoman cape rather than it’s intended purpose as a plastic blanket. I made Rob take my Superwoman picture. 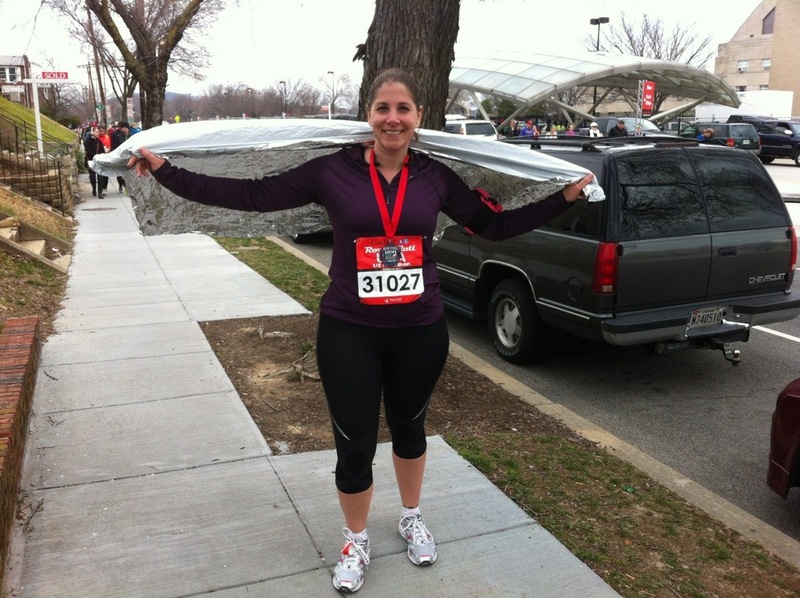 Good thing this picture doesn’t reveal how badly Superwoman was hobbling post-race! Help Me Build My Half-Marathon Playlist! Posted on March 9, 2013 by Dayna B. 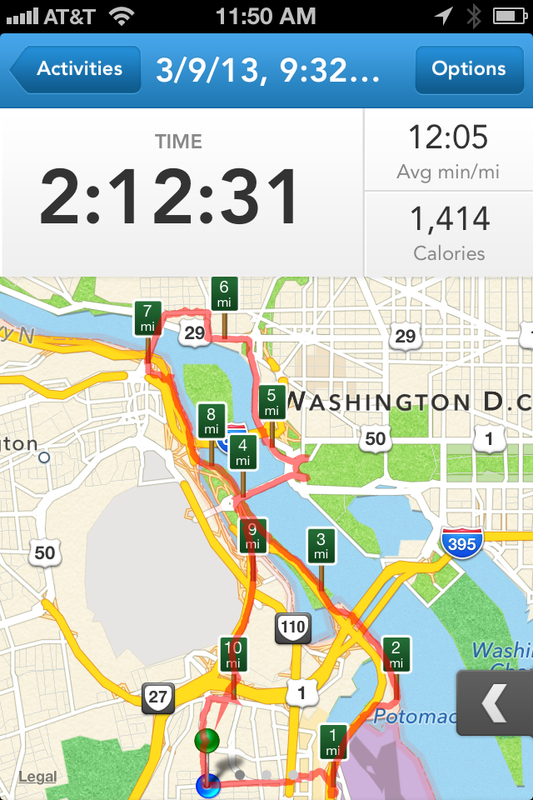 Today I completed my last long training run for the DC Rock ‘N’ Roll Half-Marathon next Saturday. I ran 11 miles this morning and I am extremely happy with my pace. Hopefully this is a good indication that I will be ready to run 13.1 miles one week from today! But I could still use a little bit of help…from you. Up until this point, I have been doing all of my long training runs with my friend Brie, but next week I will be running the race solo. Brie has kept me motivated during our long weekend runs, however, next week I will need to rely on my tunes to keep me going. Do you have any suggestions for good running songs that I can add to my playlist that will help me make it across that finish line? If so, please share. As a side note, many people have asked me if I have been losing weight as a result of all of my training runs. Short answer: No. My current running app (RunKeeper) tells me that I burned over 1,400 calories this morning. 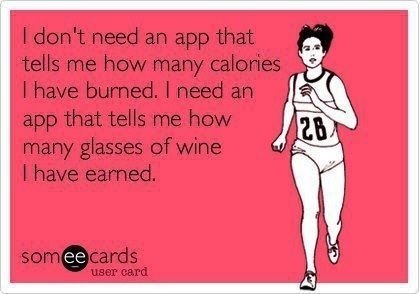 Since I actually don’t have an app that tells me how many glasses of wine I have earned…I basically assume that I can have as many damn glasses as I want! Posted on March 7, 2013 by Dayna B. About a week ago, Rob and I booked an 11 night travel package in Turkey and we got a really great deal. While the price of the package is quite amazing considering all that is included, the price tag on our airfare is even sweeter! 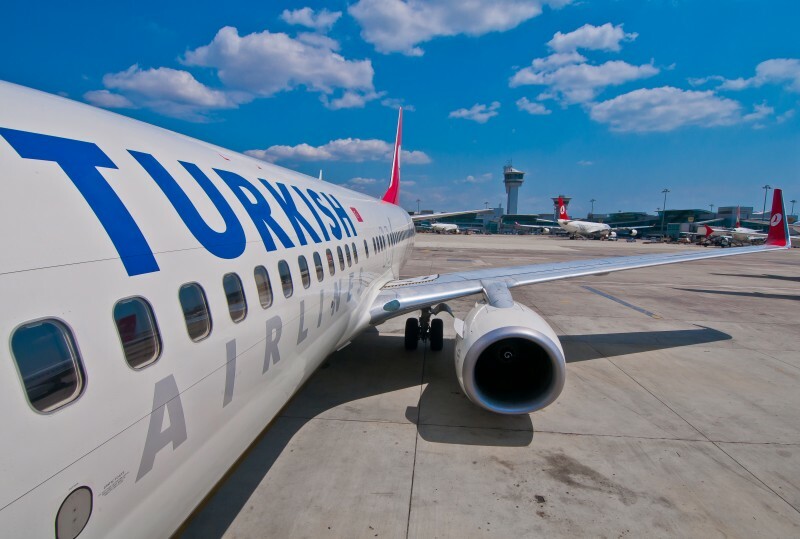 Two non-stop, round-trip tickets to Istanbul for…wait for it….$140 total! How is that possible you ask? By getting in on the credit card deals that offer big perks for travel. I started to learn about the credit cards that offer huge mileage/points sign-on bonuses about 18 months ago and I immediately knew that I needed to get in on the action! I quickly cashed in on deals earning me 50,000 points with one company, 75,000 miles with another, etc. I started to follow The Points Guy for tips and tricks on how to maximize the most out of all these credit cards and find out which ones were worth the effort and which ones were not. For someone with a passion for travel like myself, these credit cards were just the ticket (pun intended). In the last 18 months, Rob and I have used our miles/points for a variety of different flights. For example, we flew to Colorado for free using my Southwest points (I had earned 50,000 Rapid Rewards points for signing up for the Chase Southwest Premier credit card). We flew to Nicaragua using my American Airlines miles and only had to pay $65 in taxes (I had earned 75,000 bonus miles for signing up for the Citi Platinum AAdvantage credit card). And just yesterday, I purchased our tickets to Istanbul for only $140 using my Chase Ultimate Rewards points (I had earned 50,000 bonus points for signing up for the Chase Sapphire Preferred credit card). These flights should have cost us about $1,600, but my points covered almost all of the hefty bill. It was somewhat disheartening to watch all of my Ultimate Rewards points vanish in one fell swoop, but what would be the purpose of earning all those points just to watch the number grow and never use them? No, this chick will continue to wipe out her rewards balances to make her travel dreams come true! Offers like these could make your travel dreams a reality too! However, these offers change often, so be sure to stay on top of the best deals by following sites like The Points Guy. Posted on March 5, 2013 by Dayna B. We decided to give it another shot this past weekend. It was not a holiday weekend and we decided to Metro rather than drive, making it a much more enjoyable experience this time around. There were a few people in line ahead of us, but nothing like the line from weeks before. Once inside, one of the first things we saw was an original Magna Carta. It is one of only four surviving originals. This particular one was purchased in 2007 by David Rubenstein for $21.3 million. It is the last privately owned original and Mr. Rubenstein has lent it to the National Archives to preserve its place in our country’s history. We then made our way into the rotunda which houses our “Charters of Freedom.” One of the first things you see upon entering the rotunda are the giant Faulkner murals. 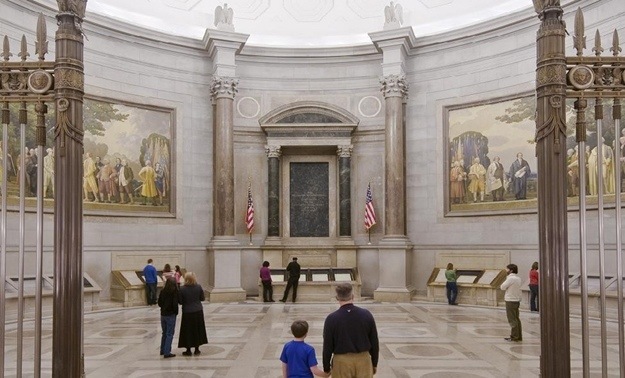 The Declaration of Independence mural and the Constitution mural are among the largest single-piece oil canvases in the country and they set the tone for the historic documents on display. It was absolutely amazing to see our original Declaration of Independence, Constitution and Bill of Rights. 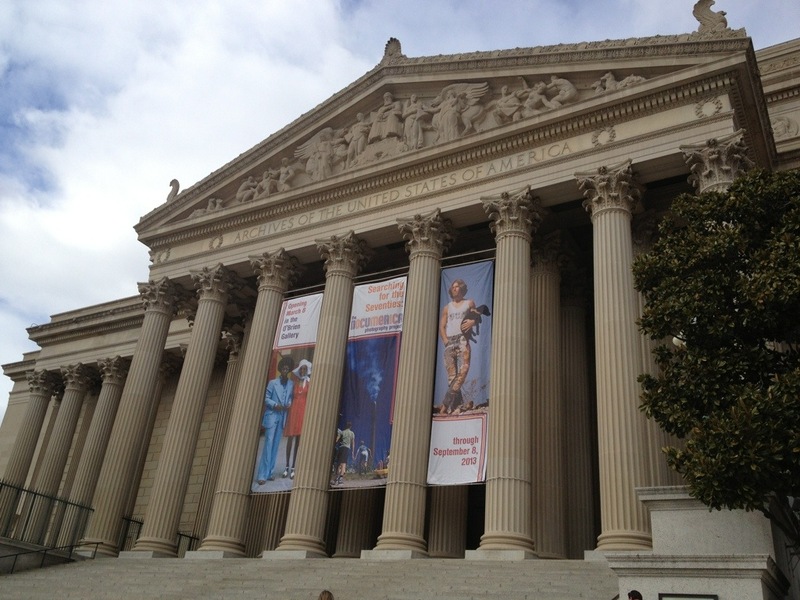 Photography is strictly prohibited inside the National Archives, so all of the pictures below are from the Archives website. 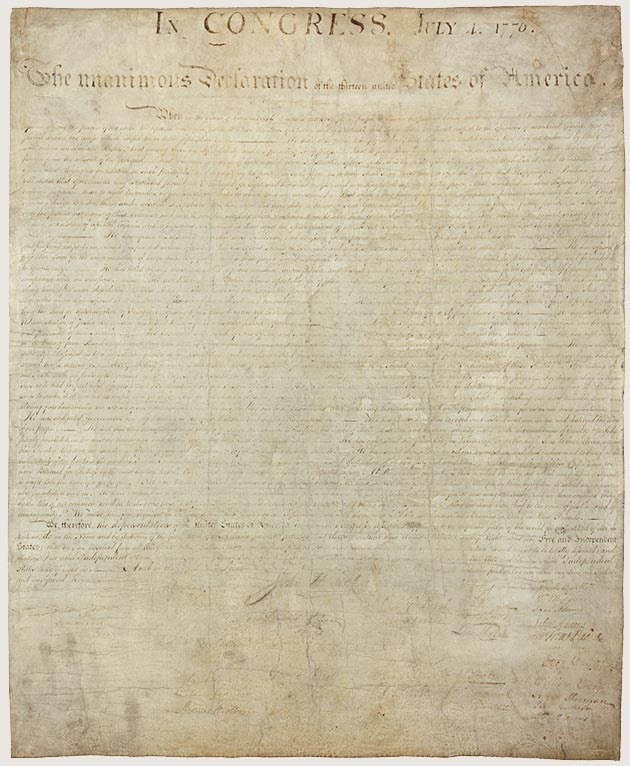 One of the things I immediately noticed about the Declaration of Independence was that it was much more faded than the other documents. John Hancock’s prominent signature was almost completely faded away. As it turns out, this priceless document was housed for over 35 years in the Patent Office Building opposite a window exposing it to damaging sunlight! I guess the sealed encasement filled with inert argon gas that houses the Declaration of Independence today was still patent pending? 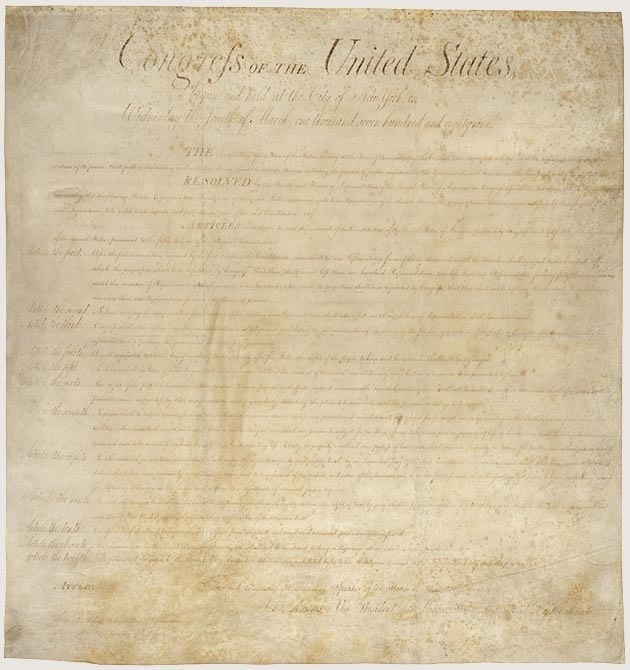 While admiring our original Bill of Rights, I overheard two guys (clearly anti-gun types) mentioning that the phrase “right to bear arms” wasn’t listed anywhere in the 2nd Amendment. Hmm? That’s odd because I am certain it is there. 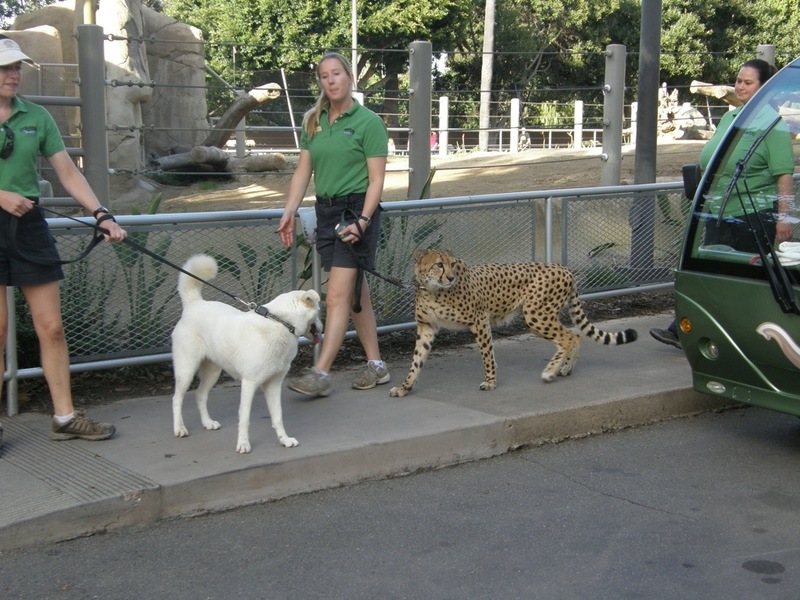 Upon second glance, I realized they were right…well, they were “kind of” right. The original document lists 12 “Articles,” but only 10 of those were ratified. Our “right to bear arms” was still there, nicely rooted in “Article the Fourth” of the original document. Our Constitution is actually much larger than I realized. The document spans four large pieces of parchment and each one is individually encased and closely guarded by the National Archives security officers. 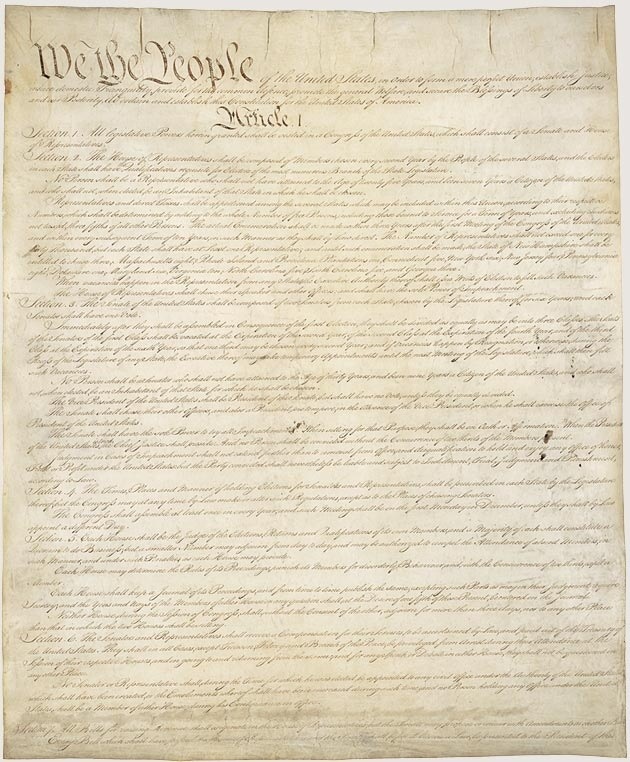 Our Constitution is considered one of the most influential legal documents of all time and it is absolutely fascinating that we have the opportunity to gaze upon the original.